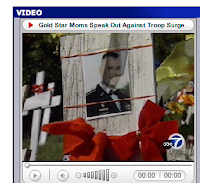 ABC Channel 7 reports on Sunday, when 3 Goldstar Mothers came to the Lafayette Crosses memorial site. Scroll down a bit to find the video at this link. NBC 11 as well as KRON channel 4 were there as well but I am still trying to find their videos.